A New Orleans-based music and filmmaking collective discuss the origins of their experimental short film. Witches over a cauldron. 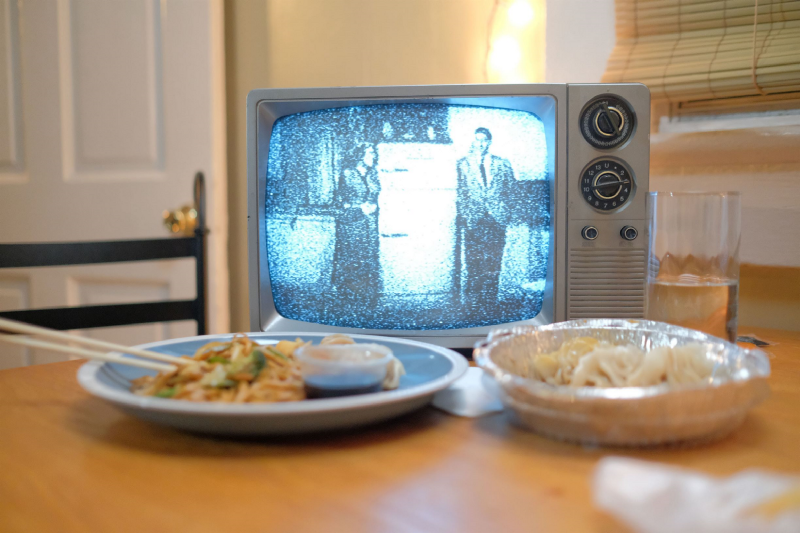 A woman eating takeout with her television. A smashed egg over a cutting board. What do these things have to do with each other? You’ll just have to see None for yourself (at the bottom of the article) to find out. Co-directed by Joel Willson and Chris Parish, None is a John Cage-inspired exploration of our relationship to technology and its effects on human relationships. Joel, a musician based in New Orleans, wanted to create something conceptual and a little ‘weird’, while Chris, a filmmaker and photographer, wanted to find some sense of audience identification. 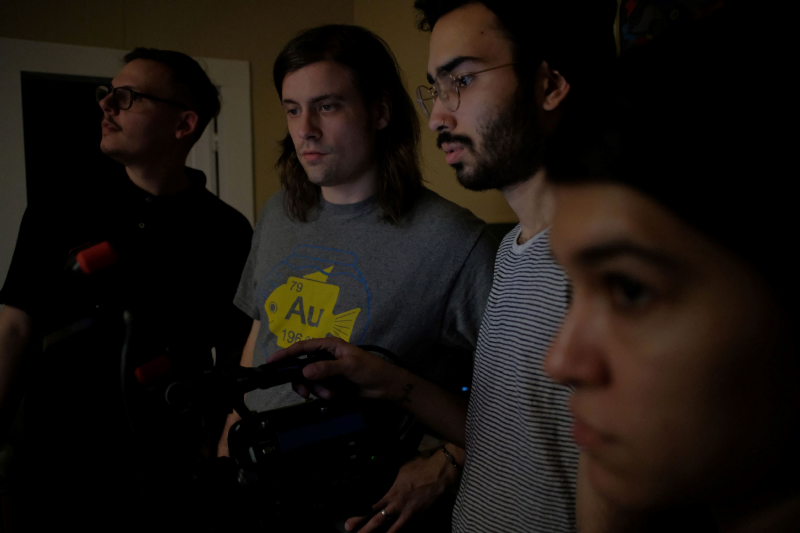 Together, in collaboration with cinematographer Alex Moreno, the three created the first of what will surely be many more short film creations. Joel and Chris talk about getting started, the unique opportunity to perform the film’s score live before an audience and the importance of watching short films in community. Miniflix Interviewer: Joel and Chris, can you talk a little about yourselves and your artistic backgrounds? Joel Willson: I’m a musician from Baton Rouge who studied composition and violin at LSU (Louisiana State University) and has been involved with music projects ever since. I actually play in a band called Minos The Saint. The idea for the short film None was born out of an event hosted at the Baton Rouge Gallery called Movies on the Lawn. Minos The Saint performed a live score for the classic silent film Sunrise. Because of that, I’ve been wanting to get more involved with short films for awhile. So I’ve made the pivot from just doing live music to also collaborating with film people. Chris Parish: My background in the creative arts is all film-related…I’ve always had a yearning for the creative arts. I’m also from Baton Rouge and shoot photos and video for weddings…this short film was something that was a little more out of the realm of what I’m used to. When Joel approached me and Alex [Moreno] about it and told me the premise of it, I was like, ‘that’s super weird.’ I’m not used to super-weird…but what led me to want to do it was that it’d be challenging for me and outside my comfort zone. Miniflix: What came first — the idea for the story, or the music? What was the collaboration process like between yourselves? Joel: It was a very conceptually driven project. I had the idea that I wanted to be more involved from the very beginning of the process. Many times when people bring in music, it’s kind of an after-thought. But I wanted to be involved with a project that had the music at the core, so it was very much infused from the beginning. Also, I’m a storyteller, mostly a songwriter, and wanted to take a shot at doing a story. Just practically, I knew Chris and Alex were awesome at photography and videography, and I knew I was strong in music, so I really wanted to do a project that used our strengths. As for who did what, I brought the original concept but after that it was the three of us the whole time working it out. Chris Parish, Joel Willson and Alex Moreno (left to right) look over a shot. M: Though the film is a commentary on the tech and digital era, you decide to represent it with “outdated” technology or old, almost historical, filmic references. Why didn’t you want to go with things like cell phones or modern computers as a representative? Was this an aesthetic choice (being vintage) or a thematic one as well? C: Alex had actually brought up the movie Her. A lot of that movie’s themes and the styles that come from that movie are very retro but also not, you know? So color palette wise the movie Her was a big inspiration for us. Dealing with a lot of browns and oranges and muted colors. Because of that, our minds wandered stylistically towards retro stuff. I don’t know if something like the tube television was what you specifically had in mind, Joel, or if it was more a matter of the style? J: It definitely came more out of the matter of style. Just the way that I think as an artist… I’m a history buff. I know art styles and musical styles and futuristic stuff…and it all starts to blend in my head. I also liked the way we did it because when you use retro gear, it sometimes creates an emotion in people. It also creates this sense of timelessness, like you’re not sure what time she’s in…it disrupts a time period. M: Can you talk more about what’s behind the juxtaposition between the woman and the man in the film? They each have their own particular lives going and seem to represent different things in the film. “None” explores our fractured relationships with each other and our obsessions with technology. M: That totally makes sense. And the moments with the vegetables have this very tactile, earthy feel. Feels very human and corporeal. J: And that’s what we wanted to go for, but it’s very conceptual so it’s not a strong narrative about that. M: Right. It’s an association you can make emotionally. C: When we started talking about this, Joel and Alex were very John Cage-inspired and I’m more like ‘Okay, but what’s the story? What are we doing here and what is the audience member going to feel from this?’ So we sat down and talked about the individual meanings behind each decision — like the vegetables being smashed and stuff — and what that was going to communicate. From the beginning of the short film, the woman character is very happy. 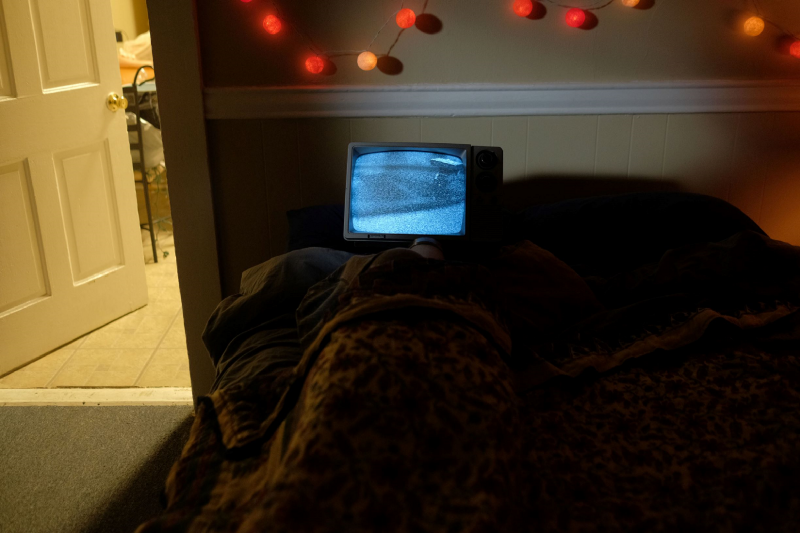 But then you see the progression of her not being so happy — to the point that at the very end she turns the TV off. I think for me at least that was communicating her starting to kind of understand that being so consumerist driven and being so consumed by a TV isn’t very rewarding. M: I agree. I think that arc really helps it from feeling random or unmotivated. J: And that was really the benefit of having a strong team. We each had different viewpoints and I think it really came together nice. M: What’s one particular element or idea of the story that you ended up having to leave on the cutting room floor, or never even made it to production? J: If we had a couple more hours, there was some more details we’d have added in, including with the mannequin. M: The mannequin? Can you talk more about that? J: Well, a mannequin was actually supposed to be attached with the TV as a head. That was the original concept. It was extremely challenging to figure out the TV on top of the mannequin. We ended up scrapping that. Just for practical reasons. We had a couple ideas, like Alex had some on the second day of shoot, but we just ran out of time. I feel like what we did produce was very effective. But there would have been more detail if we’d had more time. The TV-headed mannequin is ready for its close-up! C: Yeah, I think the TV thing was the main thing we had to cut. Also in the film there’s a scene of witches. We originally wanted to shoot that scene ourselves but we didn’t. We obviously didn’t have time to do that. We threw in the old-school retro witch scenes. J: One of the main themes when I was originally writing it came from Shakespeare. In Macbeth there’s “I dare do all that may become a man / Who dares do more is none.” That idea worked really well with the John Cage quote at the beginning of the film, which is why we called the film None. I found an original Macbeth opening with the witches (from Orson Welles’ Macbeth) and this very much, to me, played into an idea of a lucid dream. So the witches are kind of enchanting the audience. I also liked the rhythm of them throwing stuff into the cauldron; it was really musical. M: I’d actually like to talk more about the musical component. Was the soundtrack conceived before the concept, during production or after the edit? What was the timeline and process like for this soundtrack? J: The musical concepts I worked into the writing. The concepts and ideas I brought to the writing were very much like a song. So I had the outline of what I wanted the music to be scene-wise and I had that outline from the beginning. We also had a really talented editor work with us, Joseph Estrade. He’s also a musician, which is very helpful for this project. I sent him some scratches and he made the whole rough edit extremely musical. I had the themes played out on guitar and he made an edit with it. Once he gave me that back, I composed a score with parts for the different instruments: french horn, clarinet, flute, drums. In the score, some of the parts are written out and then some of it was meant to be improvised live. From a musical perspective, it was always very much meant to be a live experience. M: Can you both talk about your collaboration with Comfystone Films, and what led to the Monday Movie Mingle Screening in which you playedNone alongside a live performance of the score? J: I love the Movie Mingle; I love Josh Owen and Keith Hoffmann. I think what they’re doing is a great thing and the reason I think it’s so great is because they’re focused on community… they’re creating a platform for people to meet each other and to celebrate the art we’re making together. I met them last year. I’d already been doing four or five scores for other films just to collaborate with people. After we had the idea to work with each other, I approached Keith and said we were making a short film and we’d love to have it be part of Monday Movie Mingle. I knew from the beginning that I wanted it to be an experience. Just doing a short film wasn’t quite exciting enough, so I thought about how I could twist it just a little bit from a marketing perspective. Because people are going to remember this live performance. They’re going to remember it for a really long time. A lot of the people there had never experienced anything like this. That concept itself isn’t super unique, it’s just the execution of it doesn’t happen a lot of the time. They were both very supportive. Keith Hoffmann in particular was very involved with the production of None. He got us the TV and helped recruit our actress, Emily Russell. He connected me with some other people who wanted to help out. So they were very supportive. C: I met Josh over a year ago on a film. I’d hung out with them a few times in that environment, but I’d actually never met Keith before. He was very cool, came out and helped recruit others on set. Even before we shot, he came out and gave us some creative push-back on how we can do things in a very productive manner whenever we get on set. And the TV hook-up, of course. M: Besides the musical element, do you find the experience of watching a movie or TV show (personally) to benefit from being in a public place or in a live performance type setting? Why or why not? J: Yeah, and my opinion would be that it’s extremely important because it promotes community, which is one of the themes in the film: isolation and that not being able to connect with people is bad. I feel like the live music part is fun because it brings a little bit of life to the experience, but just the fact of doing anything — even watching a movie where the score is pre-recorded — is viable because of the community aspect. C: I think that having the live music part of it, to me, communicates that this is more than just a film — this is an experience. It definitely benefits from being in a public space for people to watch it. It’ll also be on YouTube and that’ll be great, but I would definitely say that the audience members there at the Movie Mingle would find that the screening communicated itself as more than just a short film. Especially since the edit was centered around the score itself. A lot of times productions, short films or any type of films, have the cut made, edited and then you add the music. The whole concept is shot and made, and then you focus on the score. So just the concept of switching that around a little bit and saying that we’re going to focus a lot more on the score itself, is very cool for me. The fact that we were able to do that live and have audience members react to that live was very, very cool. M: Any future short film projects in the works? J: Absolutely. We have a lot of things in the works. This was our first project as a team and I really was just trying this out to see if it’d work or not. So as a core, me, Chris and Alex worked really well together. We have quite a few story ideas. We’ve talked about doing a few different things and one of the emotions, me and Chris were actually talking about this, was sad. We did weird this time and so Chris has a story idea that we’d like to develop…and who knows what else? C: So the sad thing is definitely my baby. It’s my passion project that we’re going to start working on soon. The whole reason that we want to do this next one is that, same with None, we want to be able to invoke emotions in people. I feel like with film these days, in Hollywood and even on Netflix, a lot of stories that you watch have a beginning and an end and a climax and there’s always a resolution. That’s great and always invokes a very happy feeling when the ending’s great. But something that’s not explored as much is reality. Life doesn’t always end like a Hollywood film. So this next one, something that’s sad and doesn’t really have a resolution, is what I’d like to explore. To learn more about Comfystonefilms’ monthly Monday Movie Mingle short film event, go to https://www.facebook.com/comfystonefilms/.